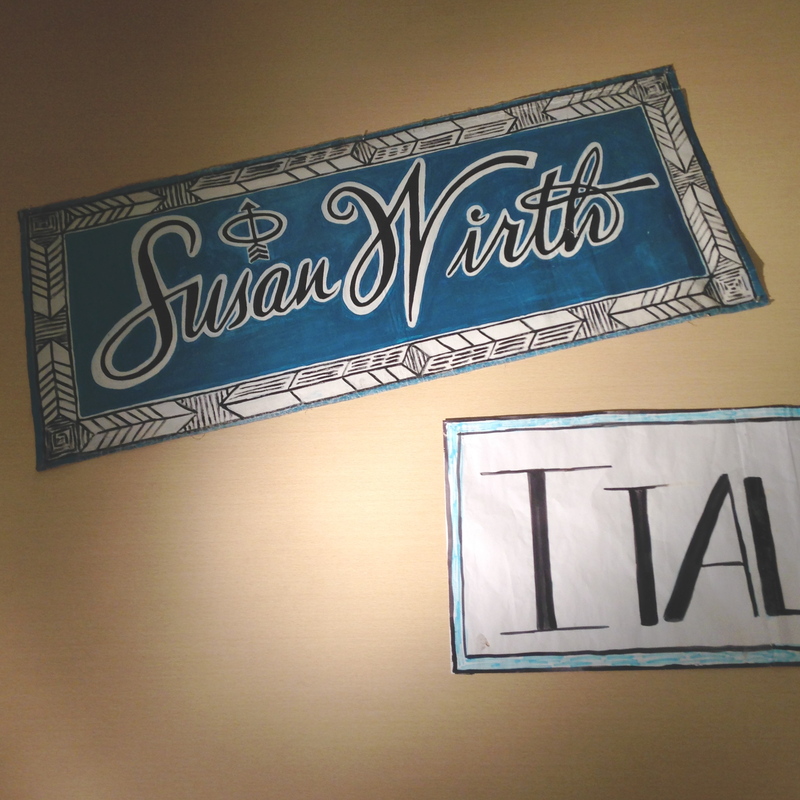 Do you know Susan Wirth? If you don't, you probably should. 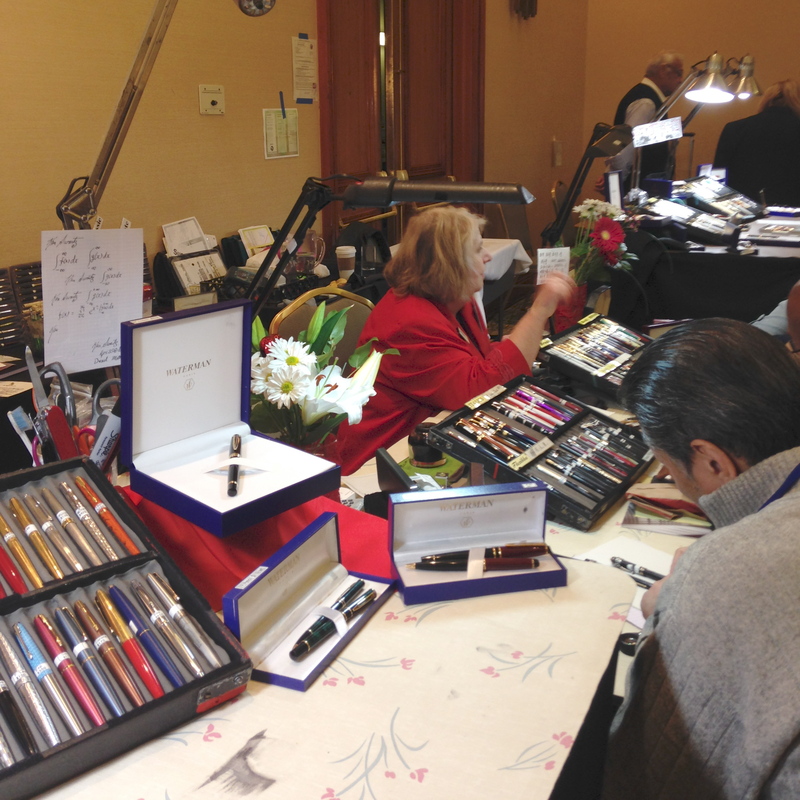 Mr. Pentulant and I attended her Saturday seminar on handwriting and fountain pens at the LA Pen Show. My only complaint is that I wish the talk had been longer - or that we could have had dinner together - or both. She knows her stuff. Susan's advice is sound. She's trying to sell pens and she gives advice about the things she sells. I trust her advice much as I trust the advice of Brian Goulet at Goulet Pens. On oblique nibs . . . Susan seemed to be saying that most people (70%?) cannot write properly with an oblique nib - it just won't work. So, if you've had trouble, there you go. On boutique inks . . . These inks are made to be pretty and do not take the pen into consideration. Susan says that if you don't mind cleaning your pen regularly and don't mind potential problems between the pen and ink, they are probably fine. She's a fan of Parker Quink (who isn't?) 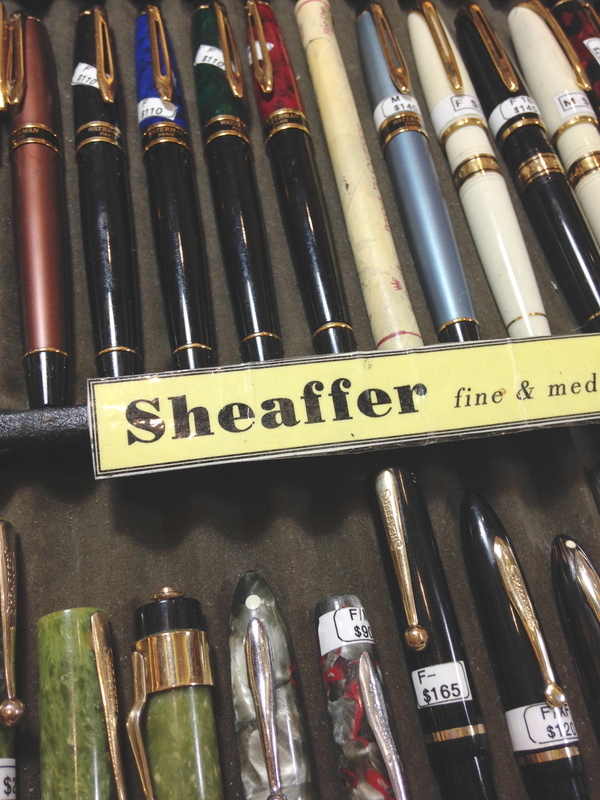 and Sheaffer - not so much a fan of Private Reserve, Noodler's, and Organics Studios. I get what she was saying - that Sheaffer and Parker made inks that would work beautifully in their pens. Private Reserve can't do that because they don't make pens. Instead, they make inks that will work wonderfully in some pens. On cartridges -vs- bottles . . . I'm paraphrasing here, but bottled inks rule, cartridges drool. Oh, and ink your pens regularly - keep those cartridges full, your pen will write better and you won't run out of ink as a surprise. On buying pens . . . You have to try before you buy. Dipping isn't sufficient as you cannot tell if there is a flow issue with the pen. The pen must be filled with ink and written with for a good test. 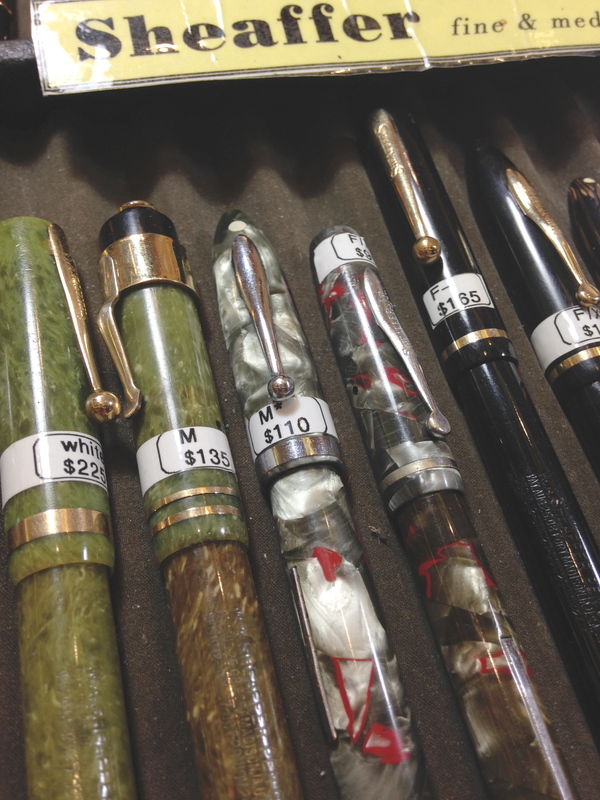 Of course, most pen sellers aren't going to let this happen. Her suggestion was that before you leave a pen show, ink that new (to you) pen up and take it for a spin. If it's just plain wrong, return it to the seller. Oh, and sit. Sit down to test pens. Most of us don't write all day standing up. On pen show admission fees . . . A girl after my own heart. Why in the world would a show that wants people to come in and buy pens charge so much for entry? The passes we splurged for were $65. Susan offered the few of us in the room the opportunity to buy from her and receive $30 off of a $100 purchase. Again, trying to sell things, but what a nice gesture, yes? As part of the seminar, Susan had each person attending write a sentence or two. She didn't want us to scribble our names, or (heaven forbid) write about a quick fox jumping over a lazy dog. She wanted us to write something that means something to us - something we would write in our every day life. Mr. Pentulant was the fourth person to write - he borrowed my pen (seriously, Mr. Pentulant? Seriously? hehe) and scribbled a fancy math formula because that is really how he spends his day. I wrote a quote about marriage because my job at Brush Dance has quotes dancing around in my head. And then she made it around to Mr. Pentulant. "Number Four, we need to get you a very fine nib to help you with those formulas." Uh. Oh. I wish there had been time for every participant to get personal feedback. Most people attending didn't have the splurge pass and wouldn't be able to immediately head to the show floor for help. Blech. 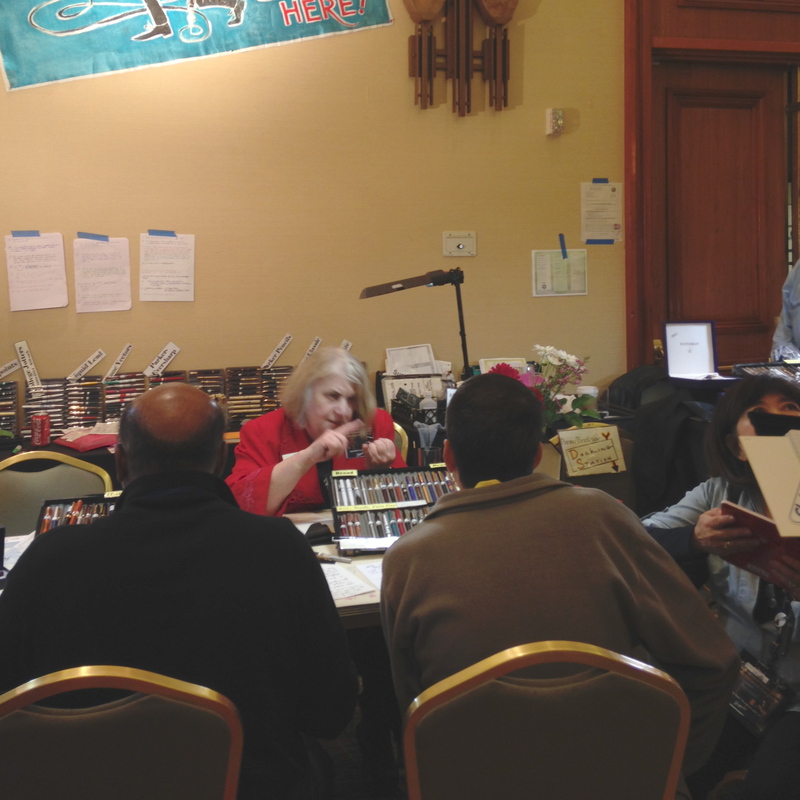 After helping rearrange the conference room (don't ask), Mr. P. and I went directly to Susan's booth/table at the show, plunked ourselves into chairs, and declared ourselves in need of pens. Susan pointed out the italic nib trays for me and said I didn't need any help - Ha! She then found the finest of fine nibs for Mr. P., and he explained that as a lefty side-writer (number six here), he has had Major Trouble with fine nibs. I think she ignored him or something, I don't know - I was off in my own little world. I'd guess that we each tested five or six pens. I learned that her person (what a terrible phrase - I wish I could remember his name <John?>) services and grinds/shapes all of the nibs. Love the cap on that blue pen - and the black one, too. There was an incredible difference between each of the italic nibs I tested. One felt completely unacceptable to me - but I'm guessing that someone else would love it. 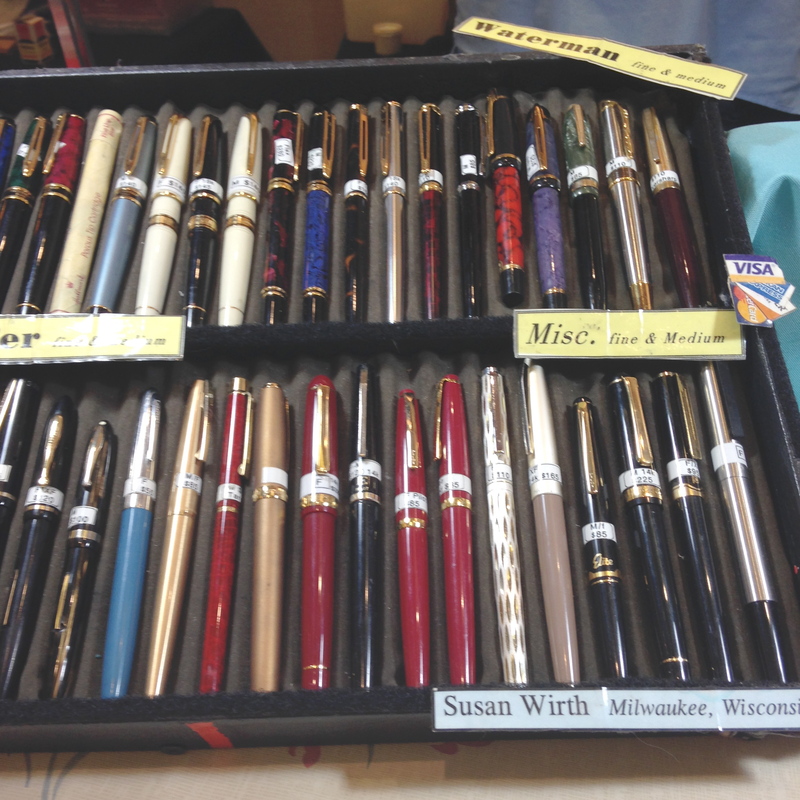 Susan attends all of the major pen shows. If you don't know exactly what you want/need, it's worth a visit to see her. She doesn't have much of an online presence (too bad). Her pens are a bit more expensive. But. They write, they write well, and they come with advice and help from an expert. Paying a little more seems reasonable, right? So. Did we buy? You betcha! 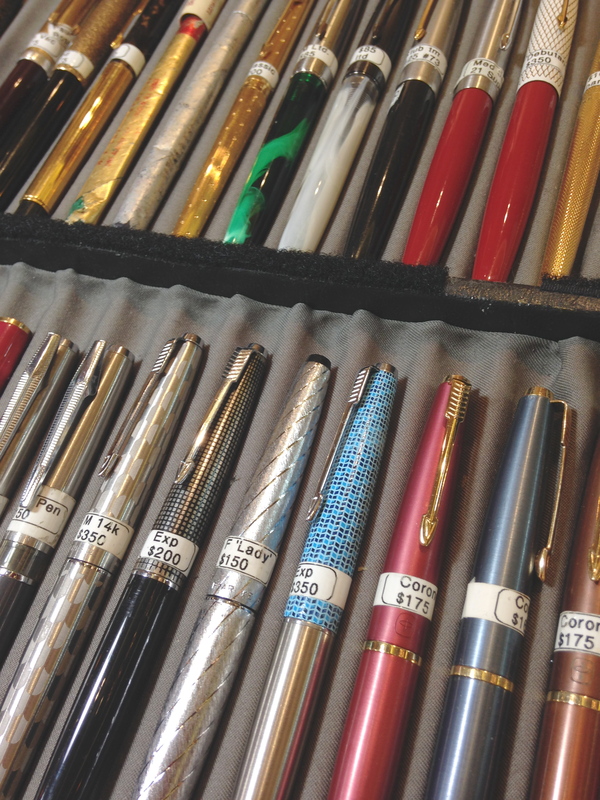 Come back tomorrow to see an overview of all our LA Pen Show purchases. We bought - omg - ELEVEN pens. And, today is the very last day to enter to win an almost new bottle of Pilot Iroshizuku ink. Thank you for reading - I know this is a longer-than-usual post. I would lose my mind at a show like that. Thanks for sharing Susan's advice and for those yummy photos! Sounds like Suzie helped tou guys tremendously! You know she was a tv personality before pen shows? She is fascinating- we usually have dinner with her in Dallas. John is a talented person himself!